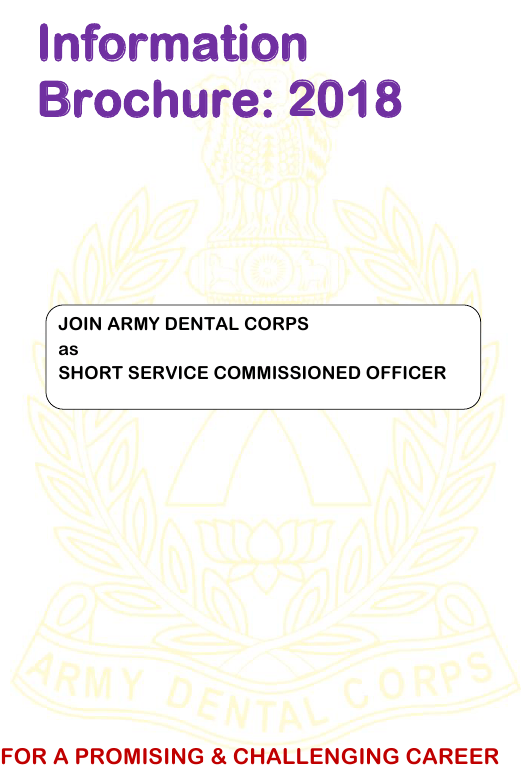 This fillable "Application Form for Grant of Short Service Commission in Army Dental Corps" is a document issued by the Indian Army specifically for India residents. Candidates are requested to visit the website regularly for updates. with the online registration of NEET (MDS)-2018. (Final BDS)/ NEET(MDS)-2018 Testing ID (Roll No.) & Score will be entertained. only to reach the address as mentioned in the Info Brochure. only be entertained if the information requested is not available in the info bulletin. working hours (9:30AM to 5:00 PM) from Monday to Friday excluding Govt. holidays. Queries received by E-Mail will be responded to within three (03) working days. Post-Graduate degree qualifications (MDS) can also apply. in final year BDS* (aggregate of all subjects). 05 yrs. BDS Course without internship. State Dental Council /DCI should be valid at least up to 31 Dec 2018.
before participating in the commissioning process. The application form may be downloaded & submitted accordingly. municipality as valid certificate of proof of age. Copy of the NEET (MDS)-2018 Admit Card. secured a min of 55% marks in final BDS. BDS & MDS Provisional Pass Certificate/Degree Certificate. Compulsory Rotatory Internship completion certificate. Permanent/Provisional State Dental Council registration certificate. Aadhaar Card of the candidate issued by UIDAI, Govt. of India (if available). acquired from the college authorities. who are shortlisted to undergo medical examination. without envelope & postal stamps of the specified amount will be rejected). eligible even if he / she has got the necessary merit. Institution) along with the deposit certificate as mentioned above. Forces Medical Services (DGAFMS) in accordance with extant rules. of application does not confer any automatic rights to grant of SSC in Army Dental Corps. criteria, as may be prescribed by the GOI letters on the subject. representative, associate(s) or officiates of the applicant candidate. and conditions in the information brochure for SSC in AD Corps for year 2018.
in due course of time, after approval of the competent authority. pertaining to Short Service Commission in AD Corps.